Castor oil can help remove stretch marks. These are awful and stubborn spots on the skin. You get irritated by their ugly appearance. These can tarnish your beauty completely. Their adverse affect on your self-esteem and personality is obvious. You can diminish them with castor oil. Apply it on thighs, upper arms, hips, tummy area and other body parts, where stretch marks are usually developed. Sudden weight gain or loss, obesity, pregnancy, tumor and swelling can be the cause of these spots. These are also formed as a side effect of taking steroids. People, who take steroids to develop muscles should be careful. You can cure many skin disorders with castor oil. Age spots, discoloration of the skin, wrinkles and fine lines can be treated with this oil. It is widely used in herbal therapy and home remedies. 1. Pour castor oil lavishly on the skin area, which is affected. Make sure it is completely dry. Remove any lotion or cream that is already applied on that part. The oil should come into contact with the tissues directly. 2. Rub it gently but continually. 4. Cover the area with saran to make sure oil does not drop down. You can also use a plastic sheet to cover it. 5. Give heat to that part of the skin for 20 to 25 minutes. Heating pad or hot water bottle can be used for this purpose. You can extend the time to 45 minutes. It is done. You must repeat this procedure everyday until you get desired results. This method is highly effective. It gives results within 8 to 10 days. Your skin should be clean and dry before applying castor oil. 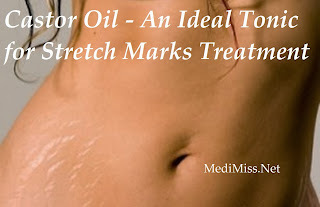 You can use stretch marks creams made with natural ingredients along with castor oil treatment. This will give additional benefits. It will also work fast. Castor oil is rich in vitamin E. This vitamin is excellent to improve health of your skin. It penetrates deep into the skin and helps develop skin tissues. It improves condition of the skin. It also makes skin supple, soft, even and free of marks. Vitamin E is ideal to repair damaged skin tissues. This ingredient is added in many creams and lotions for skin care. Many dermatologists recommend using only those products for removing stretch marks that have vitamin E. It works faster than any other ingredient. These not only lighten stretch marks but also treat hyper pigmentation, age spots and freckles in the skin. Get castor oil and try the treatment at home.